With 18M iPhones sold during Q4, Apple outsells Samsung in U.S.
For the first time ever, the iPhone was the most popular phone in the U.S. during the fourth quarter of 2012. Apple(s aapl) sold 17.7 million smartphones during the quarter, just barely edging out Samsung, which sold 16.8 million mobile phones during the same quarter, according to Strategy Analytics’ Wireless Device Strategy report published Friday. All told, 52 million phones were sold in the U.S. between October and December, and Apple and Samsung dominated the competition: together they sold two out of every three phones. The iPhone’s distinction as most popular phone during the quarter comes on Apple’s strength: holiday sales. However, for all of 2012 Samsung still bested all others including Apple — for the fifth year in a row — selling 53 million handsets, and maintaining a 32 percent share. Apple’s full year share of sales was 26.2 percent. You’ll note that this chart is, somewhat unusually, only comparing three vendors: Apple, Samsung, LG and then “others.” But that essentially sums up the state of the U.S. smartphone market: Apple versus Samsung, and that’s about it. Apple’s 34 percent share of U.S. smartphones — all Apple phones are considered smartphones — sales during the fourth quarter is not likely to be a pattern we’ll see repeated outside non-holiday quarters: Samsung puts out many different models of phones throughout the year, compared to Apple’s single annual refresh, and barring something catastrophic happening at Samsung, it’s is likely to continue as the biggest mobile phone vendor in the U.S. for 2013. What could boost Apple’s chances of overtaking Samsung outside of holiday sales is if Apple started releasing multiple models of iPhones to reach many more new customers, either through more price options, new subscription options, as T-Mobile is planning, or more screen size choice — as some estimate could start as soon as this year. How many are sitting in warehouses waiting a BOGO sale is anyones guess. However, Apple has 70+% of the PROFIT in world wide smart phone sales. Isn’t the goal to make money, not just noisy commercials. ????? I’m a big fan of the iPhone but I think this is the last generation that Apple will win against Andriod powered phones. There’s too much innovation and competition coming from Andriod powered phones and the S4 about to be announced soon won’t be good news for Apple. Apple needs to do some very innovative things with the iPhone 6 if they want to stay in the top position. I’ve seen lots of iPhones, very few of those Samsung phones with big screens. And the one that I did see, I noticed that the graphics are generally poor and there’s lots of vacant space on the screen- like the apps aren’t optimized for such a big screen. Fugly if you ask me. Apple would never accept such an ugly look- thank you Steve for caring about beauty. Iphone only wins in america…I really wonder why? Thanks Ted T. for the ability to comprehend. The entire market was down 10.7% in 2012? I don’t think so. 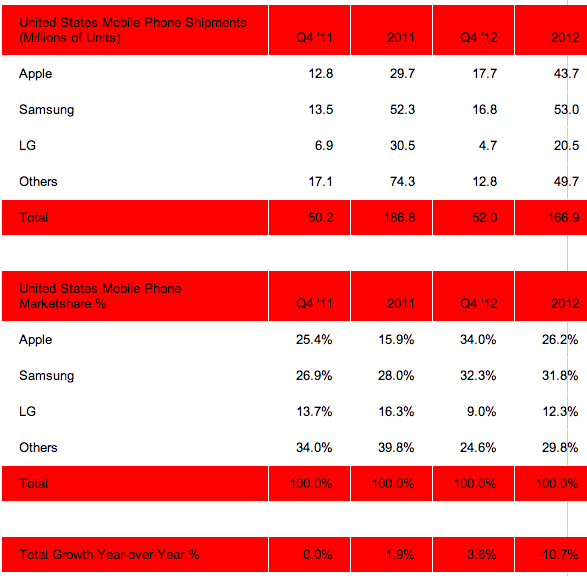 No, Apple’s share of US smartphones is well over 50%. The 34% is Apple’s share of ALL phones. Indeed it marks the first time a vendor has beaten the dumb phone makers with smartphones only. In summary, Apple’s profits exceeded Google’s revenues by ~ 2 Billion! Who’s doomed? It’s safe to say Google will never make anywhere near those kinds of profits- Google’s essentially working for Samsung for free. Dumb asses if you ask me. I would hate to be a solider in your army given your myopic perspective on actual results. Apple outsells Samsung by 1 million units for 1 quarter, news. Samsung outsells Apple 10 million units for the total year, not news? Actually it is news because Samsung’s numbs include all the millions of dumb phones they sell while Apple only sells smartphones. Now that is impressive. Yes Samsungs numbers are from $50 phones..